This downloadable summary infographic highlights the 2016-17 headline results from our research with HRN. 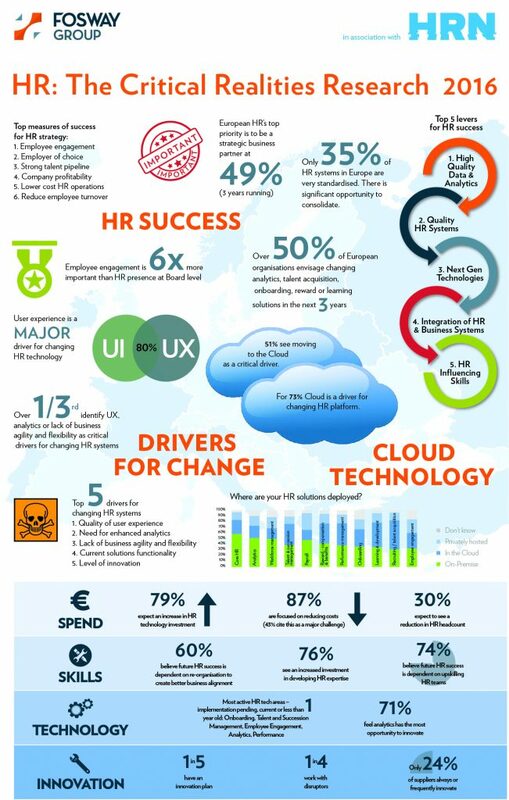 It quickly demonstrates the main challenges faced by HR professionals in Europe today. It is designed to be used alongside our series of reports that each tackle a different and specific theme from the research. HR in Europe doesn’t conform to a single set of challenges with a simple single set of answers, it is much more complex. However, understanding this complexity through real data hasn’t been easy. Research on the priorities, needs and differences for European companies has been very thin on the ground. The HR research that exists frequently has a very US centred perspective, and therefore limited value to European decision makers. This independent research from Fosway Group, Europe’s #1 HR analyst, conducted in association with HRN, looks to redress the balance. Fosway and HRN unashamedly take an international position and focus on European HR trends, challenges and realities. These reports are a complimentary resource and we hope you will find the entire series of reports useful. HR is undergoing massive change – from its demographics through to its technology, and big changes in the people agenda. But with all the talk of transforming HR, we need to understand the realities for HR leaders in Europe, as well as the global market trends and technology possibilities. Our analysts take you through the critical challenges and priorities around what’s driving change in European HR today. Stay tuned for the other reports in the series coming soon. The HR systems landscape in Europe has never been (and will never be) straightforward. From very different, fragmented operating models and HR strategies impacting technology decisions and adoption, to the silo’ed nature of HR technology architecture across different disciplines e.g. core HR, talent acquisition, performance management, payroll etc. There are many factors in play. Here, our analysts take you through the critical components of the HR technology landscape in Europe. Then in the third and final report in the series, the research explores the customer experience of HR technology. This report is coming soon. 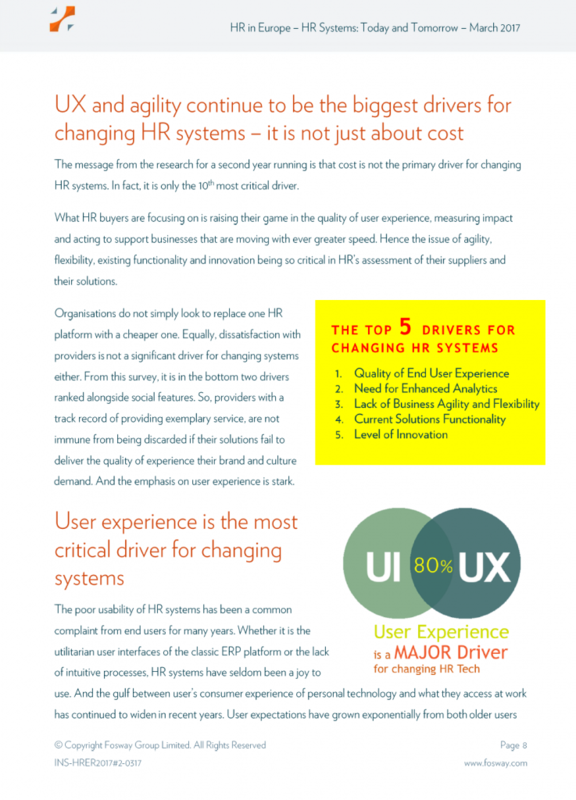 User experience (UX) is a hot topic when it comes to HR technology. But there is a bigger picture that has been ignored for too long. Customer success is a buzz word amongst suppliers of HR technology, but the stark and rather unpalatable truth is that the customer experience is lacking across the board. 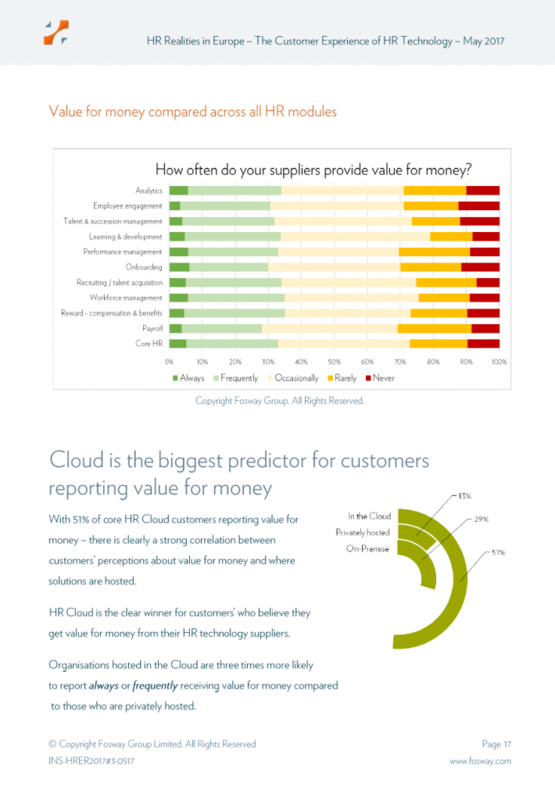 The results shared in this paper represent a wake-up call for providers and buyers alike! And for those interested, this year’s research opens soon with the results gathered from across Europe. The first glimpse of the data will be headlined at HR Tech World in Amsterdam. If you would like to take part and have your say on the realities of HR today, email info@fosway.com.